Despite laws and regulations that have increased the number of businesses that are wheelchair accessible, there is a still a significant disparity when it comes to wheelchair accessible homes. In fact, less than one percent of all U.S. homes can easily accommodate wheelchairs. The ideal situation is for all homes and businesses to be accessible to all. 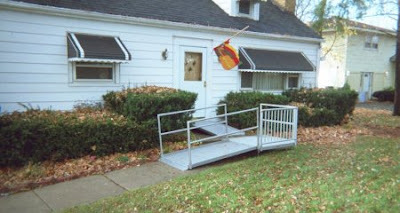 In the meantime, though, a portable wheelchair ramp can give you independence and help you easily access any building. There are lots of factors to consider when choosing portable ramps for wheelchairs to make sure you find one that is both safe and easy to use. Read on to learn some of the most important things to keep in mind during your search. First of all, let’s go over the options that are available to you when it comes to choosing a portable wheelchair ramp. Threshold ramps are wedge-shaped and usually made of either rubber or metal. While they are portable, they’re often kept in one place for a longer period of time since they don’t fold up as easily as other styles. Telescoping ramps are adjustable in length, like a telescope. They can be lengthened or shortened easily and can be used for several different obstacles and types of rises. Suitcase ramps, as their name suggests, fold up and can be stored easily, like a suitcase. They’re ideal for helping wheelchair users get over steps, curbs, and raised landings. Roll-up ramps feature a track attached to side rails. They can be stored by removing the rails and rolling up the tread like a sleeping bag. No matter what type of ramp you buy, you’ll need to take its size and slope into account. Your ramp should ideally be a bit narrower than the openings where it’ll be placed. It should, at the same time, be wide enough to accommodate your wheelchair. A good rule of thumb from the American Disability Association (ADA) is to look for a ramp with a minimum width of 36 inches. The ADA also recommends a ramp with a slope no higher than 1:12. This means that there is at least 1 foot (12 inches) of ramp length for every 1 inch of vertical rise. For example, a 24 inch rise would require a ramp length that is at least 24 feet. Height threshold also needs to be taken into account when shopping for a portable wheelchair ramp. If it’s too high or too low, you’ll face additional difficulty getting into buildings. Think about the steps leading into your home, doors with raised thresholds, and vehicle entrances and make sure the ramp you’re considering purchasing can accommodate all of them. When shopping for a portable ramp, you’ll also need to think about how you’re going to use it. Do you need a truly portable solution, or do you need a more semi-permanent solution? If you’re looking for a semi-permanent ramp (like the threshold ramps discussed above) weight and portability won’t be as important. However, if you’re going to be carrying your ramp with you everywhere you go, you’re going to want to find the lightest and most portable option possible. Ramps made of aluminum or fiberglass are usually the most lightweight and are easy to carry. Your ramp should be made with durable yet lightweight materials, but it should also include slip-resistant elements for rainy and snowy days. Portable ramps can get extremely slippery, opening you up to a whole new range of safety risks. Make sure you find one that can withstand all weather conditions and help you get where you need to go without risk of slipping and sliding. Finally, you’ll need to think about your ramp’s ability to hold your weight and the weight of your wheelchair. Think about times when additional weight will be included as well, such as when you’re carrying groceries or packages. Putting too much weight on your ramp can cause a serious safety risk, so be sure to buy one that is highly durable. There are lots of options out there when it comes to portable wheelchair ramps. There’s no one ramp that is perfect for everyone, so it’s important to take into consideration things like weight, height threshold, and portability to make sure you get the right ramp for your needs. Shopping for ramps can be overwhelming at first. But, if you keep these tips mind, you’ll be able to find the perfect option in no time!